Is there a contradiction between the theological claims that God is omnipotent and that He is love? A short time ago my teaching pastor, Bruxy Cavey was teaching on Three Beautiful Words (God is Love) from I John 4:8 (if you’re interested in this critical message you can download the podcast for free). A speaker on TV said that God being loving and being omnipotent was a contradiction. If God were loving, he would fix the world to take away evil and suffering. Since he doesn’t that means either he can’t (therefore he’s not omnipotent) or he won’t (therefore he’s not loving). This has bothered me a lot. How would you answer this? Now when I encounter challenges like this, I like to think through them and this is the reason for my post. Omnipotence is a theological term that describes God’s power as creator and sustainer of all things. I don’t believe it is ever used in the bible but rather is used by theologians to describe the sum of the teaching on God in the bible on the subject of His power and sovereignty. Before one can examine the claimed contradiction, I think it is useful to understand the word “omnipotent.” The TV speaker and I likely agree that omnipotent means “all powerful” but does that mean that there are no actions that are inherently impossible even to an all-powerful being? I think the answer to that question is “no;” there are actions inherently impossible even for the omnipotent. 1. Actions that violate the law of non-contradiction: God can’t make it rain and not rain on the same spot, in the same sense, at the same time. Choosing to make it rain means He has already chosen against making it “not rain.” The decree and its complement come as a single package. 2. In any creative process, full omnipotence is limited to the first decision. After that, all future decisions are constrained by what has already been chosen. Often subsequent choices are impossible because they violate earlier choices. 3. Omnipotence tells us what God can do, not what He will do. Allow me to elaborate on points 2 and 3. After the first line, my omnipotence as a writer has shriveled enormously. I can no longer do what I want. Everything I write afterwards has to be consistent with what I wrote before. I think God faces the same limitation of particularity. When he chooses a certain course in creation, the contingent choices have to be self-consistent. When He steps into time, what He can do now, is constrained by the choices already made. Omnipotence argues that God could lie. What prevents Him from doing so? He could put the lying words together, but choses not to because of His character. We have the same kind of power: we can all formulate a lie, but in our better moments we chose not to. This argues that there are some things God could do, but does not do them because they conflict with His essence or character. Okay so why doesn’t God end all wickedness and suffering right now? I think this is really the heart of the question that bothered the texter, Peter, and I don’t have a full answer. Here is what I have: what would God need to do to fix all wickedness and suffering right now? I think we would have to change the role we currently play on this planet and wrest from us all impulses and desires contrary to His will whether we want to give them up or not. One of my favorite fantasy book series is Robert Jordan’s Wheel of Time®. In it a group of gifted people, called channelers, have enormous powers over their fellow humans. One power they have is called compulsion. With compulsion they can make subtle changes the thinking in the ungifted or even the gifted they have overpowered. For example, a channeler might compel a highly competent general to make subtle mistakes in a battle that to lead to disaster. On the other hand, compulsion can be used to completely take over a person’s mind so that the compelled must worship the compeller and be willing to kill or give up their lives for him. In the books, compulsion was rightly seen as a great evil in all its forms because it turned humans into automatons. If my memory serves me correctly, there was a vision in the last book in which all people were compelled to be kind, productive, generous etc. But their humanity was sacrificed to make them that way against their will. They were no longer human. The protagonist saw this compelled change as a great loss to evil. I think this is the fundamental flaw in having God fix things right now—it would have to be done against our will and our nature and that action itself would be an evil even if the end were good. I believe God is fixing things (perhaps it might be more correct to say He has fixed things in Christ) but the full effect of the cure has not fully spread through the system yet. The need for the means and the end to be true and good means the process will take some time, but it encourages me enormously that God in Christ came down into creation as a man and suffered right along with us. He was born into a poor family, of an oppressed people. His father likely died when he was a young man. Finally, he was crucified as an innocent man, while dying for His enemies who did not value His death at the time. This gives me great hope that God deeply cares about our (and my) condition in this flawed and marred world filled with flawed and marred people. One of my favorite pictures is the one shown at the head of this blog taken of a framed print in my home. 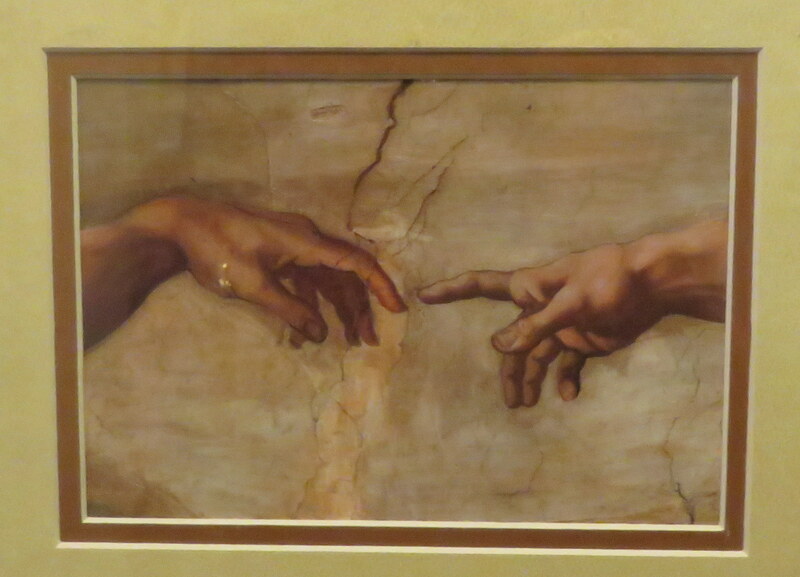 In Michelangelo’s fresco of The Creation of Adam, God is seen as touching Adam’s finger ever so slightly. Through this lightest of touches, He is communicating His love, but also His gift of independence and free will. The touch is there so Adam can choose to move toward Him or away from Him. Alas, we have moved away. He pursues us, but the touch continues to be light to preserve our free will. It is always my choice whether I move toward the touch or away from it. If I have to choose between becoming automaton or having God work the process to bring us home when we are willing to move towards Him, I choose His timing and process. I must end this blog with a protest about theologically-skeptical snipers. I can’t directly complain about texter Peter’s TV speaker because I never saw the program, but I have seen many others like it. The speaker, in criticizing theism or Christianity trucks out some challenge and then leaves it hanging. In my experience, they never go on to say: “This is my world view and this is how I answer this question that I have just asked.” That would reveal that their own answers are at least as problematic as the Christian’s and thus leave them open to challenge. In other words, these skeptics are often not skeptical enough because they don’t challenge their own views along with the Christian’s. In my mind, these speakers are like snipers who are happy to lie hidden in the brush taking pot shots at their opponents. As long as their own position is undiscovered they can happily fire away without taking any return fire. 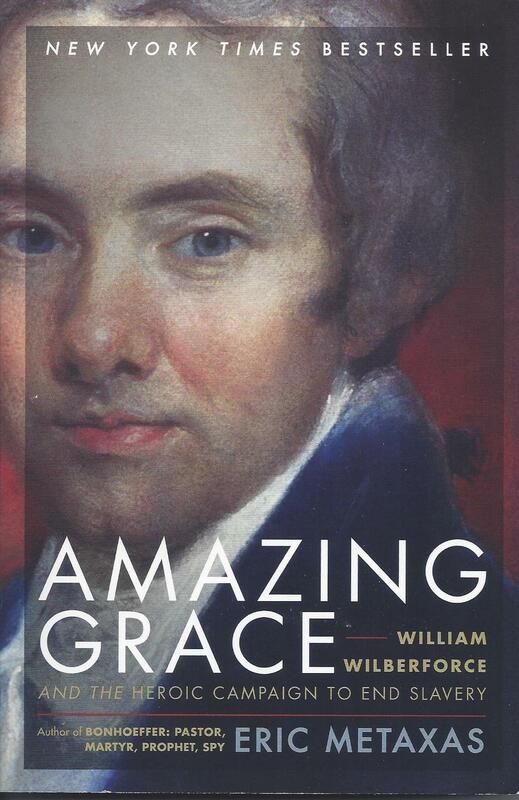 Perhaps it was because I am reading Eric Metaxas’ excellent book Amazing Grace that the words of the hymn Amazing Grace (John Newton, the ex-slaver-Christian-convert likely influenced William Wilberforce to work to eliminate the slave trade) struck me so forcefully at the Good Friday service at my church The Meeting House in Oakville. It struck me how often this sequence of “ grace teaching my heart to fear” followed by “and grace my fears relieved” is followed. For me this pattern of “grace teaching my heart to fear” followed by “and grace my fears relieved” is important. The first step teaches how dangerous my current state is and how insufficient I am to rescue myself, while the second proves that my rescue is taken care of by someone who loves me. All I have to do is give my honest permission. I published this post a while ago when I first read The Shack. The original post was lost when my WordPress server had to be decommissioned. Now that the movie version is coming out, this may be of interest. Warning: If you haven’t read The Shack and are planning to read it, leave this review until later since I do discuss the content. My overall rating is 4 stars. The Shack is a thought-provoking book well worth reading. 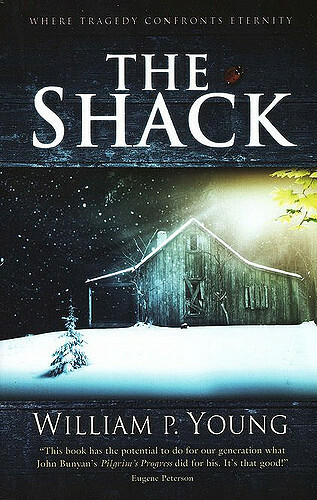 The Shack is a novel that tackles very difficult questions in a way that puts the reader in the very middle of the action and challenges him to tackle the questions in a personal way..
Mackenzie Allen Phillips lost his young daughter to a serial killer. MacKenzie called this trauma, which tormented his life, THE GREAT SADNESS. One day he receives a letter from Papa (his wife’s personal name for God) that invites Mackenzie to meet ‘Papa’ at the shack in the woods where Missy, his daughter, was brutally murdered. The shack is the last place in the world he wants to go, but eventually he decides to go without telling his wife. God appears as three people (Papa, Jesus and another woman called Sarayu (wind)). Mackenzie is able to watch them interact, watch them serve him, and answer his questions. What Young achieves are scenes that are not simplistic, but rather convey to the readers the complexity of fashioning and then sustaining a world that has free will, independent agents that make moral choices (e.g. human beings) and God. Although God is All Powerful and Good yet He still has to work within His own rules and His own character and honor the free choices made by human beings. For me, this book caused me to think about who God is and how simplistic my own caricatures of Him are because of the unconscious assumptions I bring to the table when I think about Him. For example, as C. S. Lewis has pointed out somewhere, in God moral character and will must coincide in some fashion. For human beings, morality is something objective that is above us, and we have a duty to obey these moral imperatives. However, if God had moral imperatives in the same sense we have, then He wouldn’t be God, since the moral law would be above Him. On the other hand if moral law were simply an invention by God, it would be arbitrary. As I read the book, I had to grapple with this conundrum. I saw that this fusion of morality and will in God is one of the things that puts Him beyond my understanding. If you go to amazon.com, and read comments on this book, you will find many that laud it, and some that most emphatically do not. Some of the objections are theological. Respondents argue that the book fails to properly account for some point of theology. I think that claim is fair, but it misses the point. Young has written a novel and wanted to bring us into an interaction with the person of God in a new way. I think it is better to learn what one can from the book, without trying to make it into a theological treatise. If you’ve read the book or watched the movie, I would like to know what you thought of it. Writer Stuart Aken, in his blog entitled I’d Like to Know: Why? #3 Religion, asks the provocative question: “Why are We Required to Respect Religion?” This question is of interest to me as a Christ-follower (even though I would not characterize myself as religious—I know other people would characterize me in that way). As I thought about Mr. Aken’s blog, it led me to think about how the phrasing of the question channels the responses that this question elicits. It’s always handy to set up a contest or a discussion so that only one side is given the bows and arrows while the other is left only with a shield. It’s like a Canadian or American football game where the rules of the contest allow only one team to play offence (and hence is best set up to score points) while the other is perpetually on defense. I think such a rule-based asymmetry is neither sporting nor does it readily necessarily let the better team prevail. If one looks at the question in its current form, then Christians, Jews, Muslims, Hindus, and other adherents of a religion are on trial to justify their beliefs and explain why their beliefs merit respect, but atheists, agnostics, materialists, and secularists are excluded from scrutiny by the form of the question itself. 1. Now everyone, religious and agnostic alike has a chip in the game and has beliefs that may be called into question. 2. It ought to be understood that everyone intrinsically believes that their World View best explains the real world (material and spiritual). 3. Any criticism that is leveled at another World View can also properly be asked of one’s own. So if one asks if religious world views are prone to violence, one has to ask if one’s own World View is different in this regard and why. 4. In this kind of a discussion, if one begins to believe that many of the key things one genuinely believes about the nature of reality are wrong, this will be a very unsettling development for everyone who experiences it—not just religious people. 5. Finally, I think it prevents participants in the discussion from making the disastrous mistake of assuming that all religions are really the same, merely because they are religions. Even within a religion there may be substantial differences in World View by adherents because of differences in emphasis, in interpretation of sacred texts, in theology, or by reconciliation with other sources of evidence. Thank you Mr. Aken for raising this important topic. Perhaps as time becomes available, I will be able to give my perspective on some of the other follow-on questions you raised in your post.